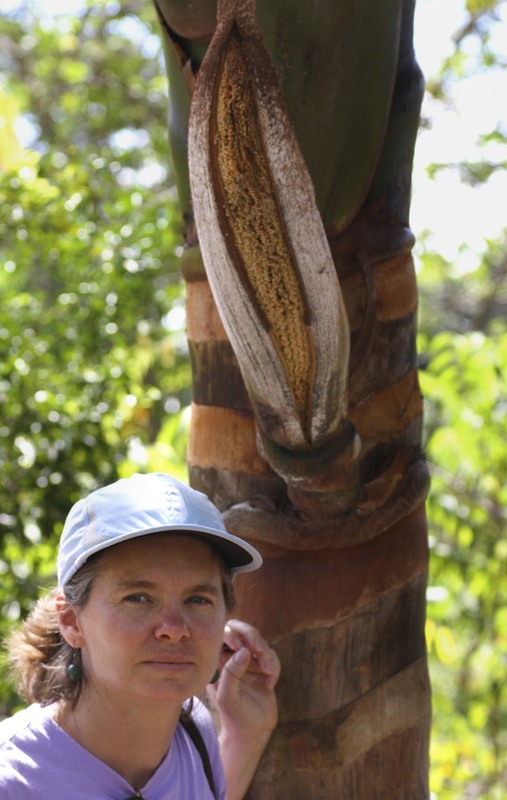 Starting with the September 2013 issue we will begin to highlight some of the innovative research published in Biotropica with our new ‘Editor’s Choice’ series. These articles represent particularly novel approaches to the study of important questions in tropical biology and conservation, and they are prime examples of both compelling research and clarity of presentation. Each selection will be accompanied by an essay written by the authors explaining in the relevance and importance of their work, which we hope you will share with your students and colleagues. I am pleased to announce the inaugural Editor’s Choice article: Levi, T., K. M. Silvius, L. F. B. Oliveira, A. R. Cummings, and J. M. V. Fragoso. 2013. 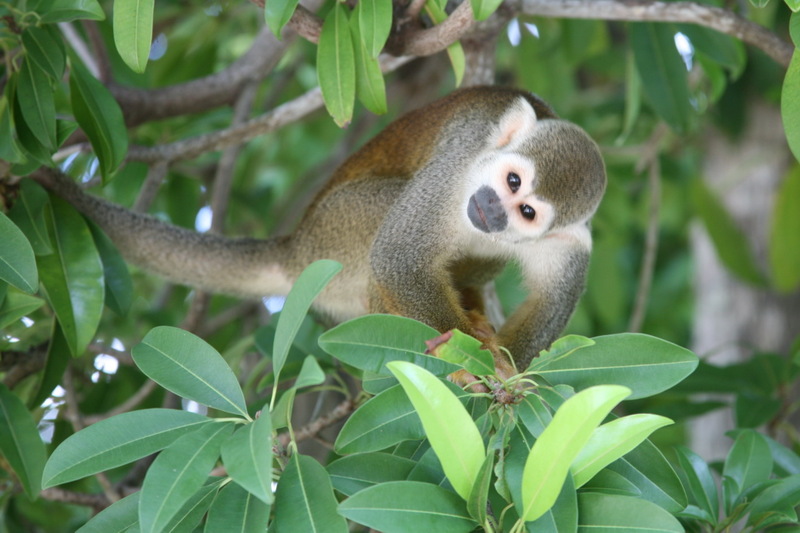 Competition and Facilitation in the Capuchin–Squirrel Monkey Relationship. Biotropica 45:636-643. Brown capuchin monkeys, Cebus apella, and squirrel monkeys, Saimiri sciureus, form interspecific foraging groups throughout South America. This mixed-species association is intriguing because capuchins are much larger than squirrel monkeys and actually prey on similarly sized mammals, nevertheless, they not only feed together but also travel in together in group. Even more intriguing is that this association falls apart depending on the species of capuchin that is present in a location. Levi and colleagues tested the degree to which the distribution and abundance of Cebus and S. sciureus is determined by habitat type, fruit availability, and geography (i.e., determinants of the fundamental niche) relative to interspecific interactions, such as competition and facilitation (i.e., the realized niche). This study nicely demonstrates how detailed natural history data can be coupled with sophisticated statistical analyses to address a long-standing question in tropical biology in cases where experimental manipulations are not feasible. In doing so they both advanced our understanding of ecological theory and elucidated the factors underpinning the fascinating natural history of these charismatic and emblematic species. Congratulations to Taal Levi and his co-authors. In November Taal begins an NSF Postdoctoral Fellow in the Department of Biology at the University of Florida, and when his fellowship is completed he will begin a faculty position in the Department of Fisheries and Wildlife at Oregon State University. 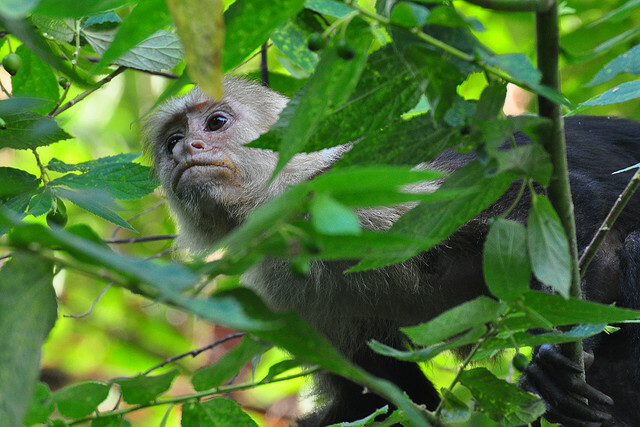 Dr. Taal Levi writes:Brown capuchin monkeys are the bullies of tropical forests. They are more omnivorous than other Neotropical primates, eating insects, birds, eggs, coati nestlings, bats, rodents, and even small primates in addition to fruit. Nevertheless, they allow large groups of tiny squirrel monkeys to feed and travel with them. Where I first watched them in Peru, groups of capuchins and squirrel monkeys nearly always occur in semi permanent mixed-species groups, but this association is ubiquitous throughout the Amazon basin. With all the emphasis in ecology on predation and competition, one would think that these capuchin bullies wouldn’t tolerate all these squirrel monkey competitors and that these tiny squirrel monkeys would fear these potential predators. So why do these two species form stable mixed-species groups? This is a decades old problem in tropical ecology. From an evolutionary perspective, these stable mixed-species groups could form due to many combinations of reduced predation risk and increased food availability. Squirrel monkeys might benefit by associating with the much larger brown capuchin, or brown capuchins might benefit from the many eyes and ears in a large squirrel monkey group. Similarly, squirrel monkeys may benefit from feeding on the messy remains left by brown capuchins, or brown capuchins may quickly dominate resources found by squirrel monkeys. Although we cannot explain precisely why these mixed-species groups occur, perhaps we can determine how important they are to structuring primate communities. Neotropical forests can accommodate up to fourteen sympatric primate species. Previous work has suggested that primate diversity can be maintained when species partition habitat types, food resources, and vertical canopy structure in accordance with the classic paradigm of the fundamental niche. The fact that congeners seldom coexist in primate communities supports the role of strict partitioning. Hutchinson emphasized that species are often restricted to a narrower realized niche by negative interactions such as competition and predation. However, a growing body of evidence suggests that facilitation, or positive interactions among species, also plays an important role in the structure of ecological communities. We asked how the interaction between brown capuchin and squirrel monkeys influences their ‘success’ as measured by realized population density. The best way to answer this question would be to remove one species and measure the change in birth and survival rates of the other species. Unable to do such a manipulation with primates, we took advantage of a natural experiment. In Guyana the range of the brown capuchin monkey meets the range of the wedge-capped capuchin, a distinct but similar species. We found strong evidence that the brown capuchin and wedge-capped capuchin competitively exclude one another. That is, brown capuchins are absent where wedge-capped capuchins are abundant and vice versa. For some unknown reason, squirrel monkeys associate far more with brown capuchin monkeys than any other species of capuchin. We used the competition between the two capuchin monkeys as a natural experiment where brown capuchins were available to squirrel monkeys at some sites or unavailable due to exclusion by wedge-capped capuchins at other sites. We then tested the degree to which the distribution and abundance of capuchin and squirrel monkeys are determined by habitat type, fruit availability, and geography (i.e., determinants of the fundamental niche) relative to interspecific interactions, such as competition and facilitation (i.e. the realized niche). 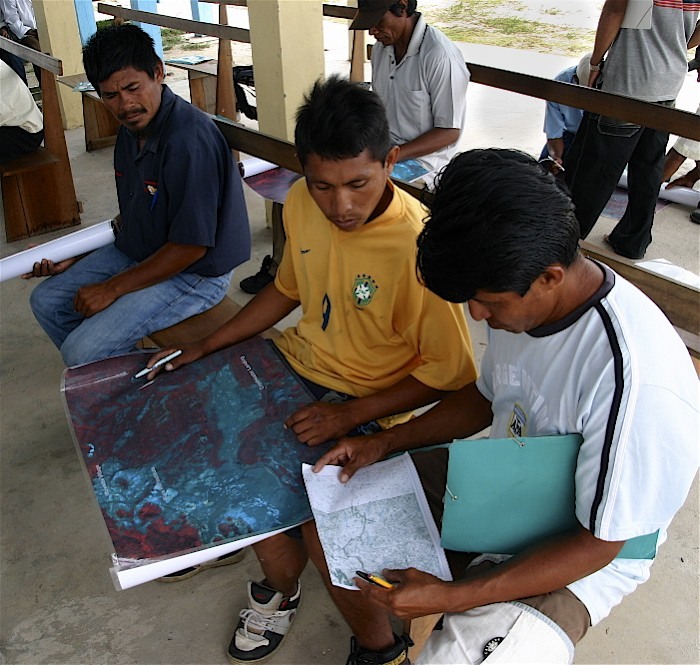 Data on animal and fruit abundance were collected by Macuxi and Wapishana field technicians on 94 transects spanning a 48000 km2 study area as part of a larger study led by Joe Fragoso. We used a combination of remotely sensed data from satellites and field validation to classify the proportion of each transect within distinct habitat types that differ based on forest structure, and whether they are seasonally flooded or terra firme forests. We also recorded the elevation, slope, and aspect of each transect. Joseph, Makushi technician measuring distance to a sighted animal. He is in cloud forest on top of the Kanuku mountains. We first noticed that the density of squirrel monkeys was highly correlated with the density of brown capuchin monkeys. In fact, squirrel monkeys did not occur on a single transects where we did not also observe brown capuchins. Brown capuchins did occur on several transects without squirrel monkeys but were never abundant. Of course, one plausible explanation for this pattern is that squirrel monkeys and brown capuchins have similar habitat preferences or diets. We found that even when controlling for habitat, fruit availability, and geography, there was strong evidence that competition between capuchin monkeys and facilitation between brown capuchins and squirrel monkeys influence the population density of each species. Squirrel monkeys were positively related to brown capuchins, and unrelated to wedge-capped capuchins. They were also strongly associated with seasonally flooded forests and with fruit availability. Brown capuchins were associated with squirrel monkeys and excluded by wedge-capped capuchins, but were relative habitat generalists. Wedge-capped capuchins were associated with higher elevation sloping terrain, and terra firme forests, indicating that perhaps they have a competitive advantage over brown capuchins in upland habitats. 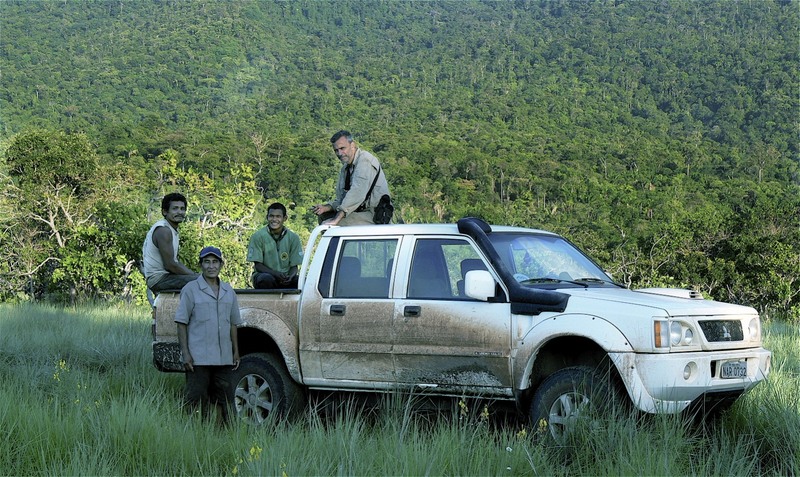 One of our transect search teams parked at the base of the Kanuku mountains. 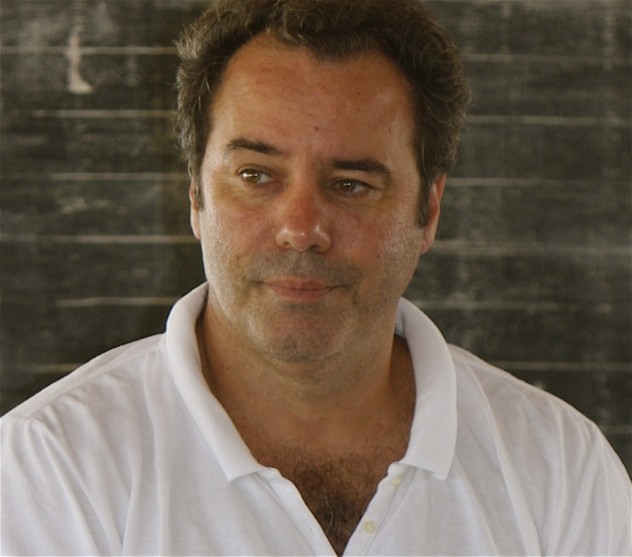 Sitting on the roof of the pickup is co-author L. Flamarion de Oliveira, a researcher with Brazil’s Museu Nacional. In the back of the pickup are Joseph and Samson, two of our Makushi technicians who actually walk the transects alone. This is evidence that species interactions are playing a large role in determining the distribution and abundance of each species. It is not a surprise that competition between capuchin monkeys largely determines their population density, but the dependence of squirrel monkeys on brown capuchins is new evidence that positive species interactions can be determinants of primate community structure. Several questions remain. For example, what do the brown capuchins provide squirrel monkeys that the wedge-capped capuchins do not? In addition, do squirrel monkeys help brown capuchins compete with wedge-capped capuchins – that is, if one were to remove squirrel monkeys would wedge capped capuchins successfully invade brown capuchin territories? We can only add to the speculation as to why these two species like to live and travel together. Makushi technicians Handley and Wycliffe get insights on where to place transects. 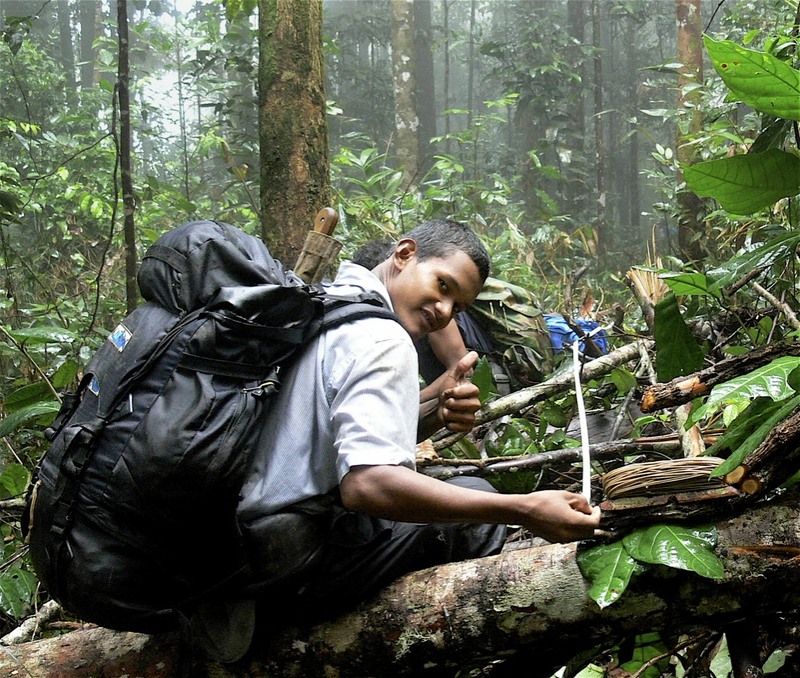 They located and opened all the transects around their village.